Google+ is the new kid on the social media marketing block. Is it useful? Can you use Google+ for marketing? If so, how? Where are the opportunities? Chris Brogan has one of the first books out on the subject. It’s a good book, but in my humble opinion, misses the point. Google+’s main opportunities lie in authorship and personal pages, not in using Google+ in a way similar to how we use Facebook. Still, that said, this is one of the first books and recommended as a buy. This is one of the best books there is on Google+, which doesn’t say much because Google+ is so new, and especially so new to marketing. As I read the book, I liked it. I thought it was pretty good. But then – as someone who teaches Social Media Marketing online (Google ‘Jason McDonald’ to find me), I started to take it apart, started to think through my own ideas about what is really unique about Google+ vs. Facebook. Then it hit me: Chris misses the point. He really misses the point in this book. One of the themes of Chris’s book is that Google+ is an improvement on Facebook, but one backed by the world’s largest search engine. That’s true, but if Google+ is going to be just like Facebook, with just a few tweaks and changes, it won’t work, in my humble opinion. Microsoft, after all, was much, much bigger than Google yet Google took over search, even though Microsoft easily killed Netscape. Kodak was once a huge company, and isn’t exactly a formidable force in photography, is it? So there are no guarantees, even if you have powerful backing. This matters because the approach that Chris takes is, largely, to recommend that you use Google+ for marketing similarly to how you might use Facebook. Create a business page, engage with customers in conversation, use a soft sell. All very well and true. But how is Google+ different? Where are the unique opportunities? The digital photography to Facebook’s print photography that might be the game changer? Google+ is sponsored by Google, says Chris. And that’s incredibly important. Yes, all very well and true. But it’s not – I would argue – what will make Google+ succeed. What will make Google+ succeed is the integration of Google+ with search: a.k.a., social search. Through AUTHORSHIP and the RICH SNIPPETS (schema.org) profiles, all a bunch of mumbo jumbo, a witches’ brew of geek speak (so far). What does this mean to you and your business? Google+ + Search = Social Search, and social search causes pictures of ‘gurus’ to appear next to the snippets returned in a Google search, or pictures of your close friends as you search through personal results. Try some searches that are common, and matter to you. Be logged into Google+. Look for pictures. Watch, wonder, and learn. That’s authorship at work. 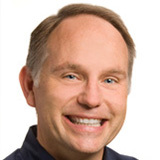 How do you influence authorship on Google+? That question isn’t even asked in this book, let alone answered. That’s a huge problem. Authorship is THE huge opportunity today in Google+, with huge implications for marketers. First, it puts the center of gravity on the person (not the company) in Google+. That’s different from Facebook. Second, it provides opportunities for rich snippets (pictures and profiles) on search results IF you reach a threshold of enough Google+ followers. And, third, it shares your pictures and +1’s with your friends through the social network of Google+. What’s really cool and possibly game-changing about Google+ is social search. 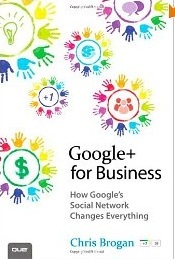 This book – admittedly rushed to press by Chris Brogan – misses the game-changing aspect about Google+. Hopefully my review points this out. Buy this book! It’s a good one… BUT search Google for ‘rich snippets’ and ‘authorship’ or even better ‘Google+ Marketing for Small Business’ and make sure you understand authorship, as that is where the first fruits of Google+ are actually coming. If you are looking to learn about Google+ for small business marketing, I recommend you take my free webinar, Google+ Marketing Tips for Small Business: Google Social Search and SEO.